You probably already know that having spelling and grammar mistakes in your content is bad for your bottom line. But here are a few facts: BBC stated that spelling mistakes are costing millions in lost online sales; Disruptive Communications found that spelling and grammar mistakes will do the most damage to a person’s opinion of a company or brand; and Real Business cited that 59% of people “would not use a company that had obvious grammatical or spelling mistakes on its website or marketing material”. Even when you proofread your content multiple times, mistakes make their way into published posts, and that’s why we created a Perfect Tense plugin for WordPress. 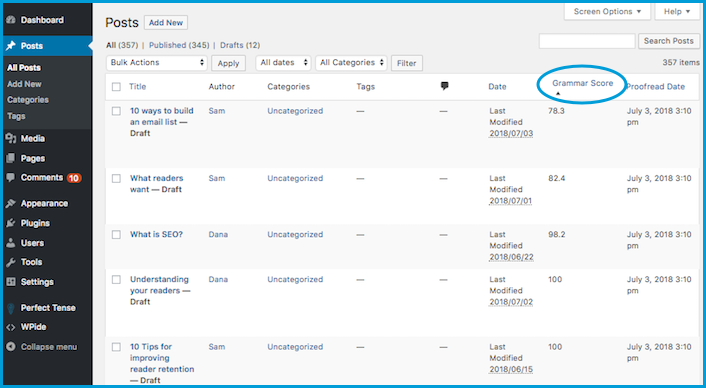 When integrated with WordPress, Perfect Tense will automatically correct errors in your posts, filter out low-quality comments, and even let you know what content is ready to publish and what needs your attention. 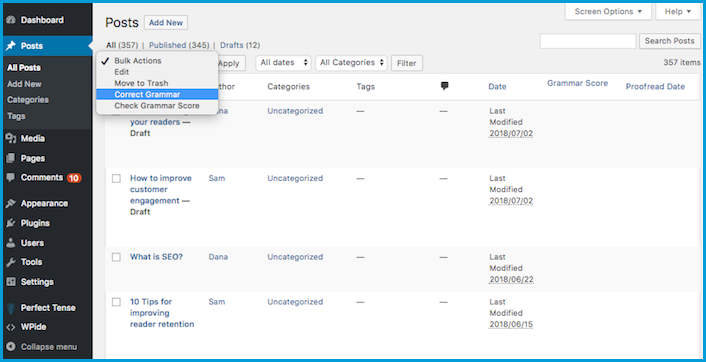 After you’ve installed Perfect Tense, the first thing you’ll want to do is make sure all your published posts and current drafts are error-free. You can easily calculate a grammar score for all your posts at once to see if any need your attention. 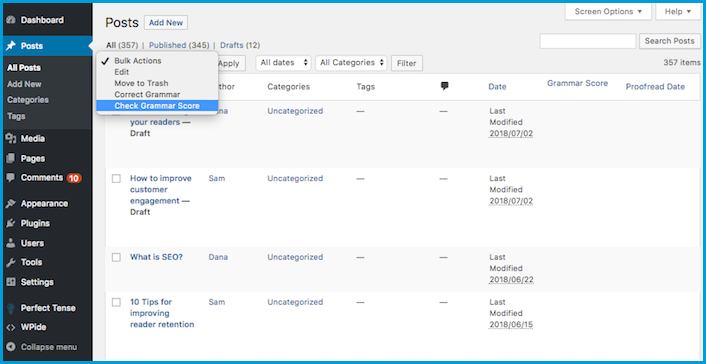 Once you have calculated the grammatical quality for all your posts, you can easily sort by the grammar score to see which posts need to be proofread. From here, you can go into any post and have Perfect Tense show you all the errors, giving you control over which corrections are automatically applied. If you don’t have time or don’t want to go through each post individually, all you have to do is select “Correct Grammar” for all the posts you want automatically corrected. Once you’ve taken care of all your published posts and current drafts, you can set Perfect Tense to proofread all future posts. This applies to all posts whether they are created in the WordPress editor or on a third party platform and set to auto-publish. If you want to truly automate your proofreading process, you can set Perfect Tense to proofread and correct all future posts before they are published. If you want a more hands-on approach to proofreading, you can set Perfect Tense to flag any posts with a grammar score below a certain threshold so that you can review them before publishing. In a matter of minutes, you can make sure all your past posts are error-free and that all future posts will be proofread before they are published! Millions of people read blogs every day. Don’t let something as simple as a spelling or grammar mistake scare people away from yours. 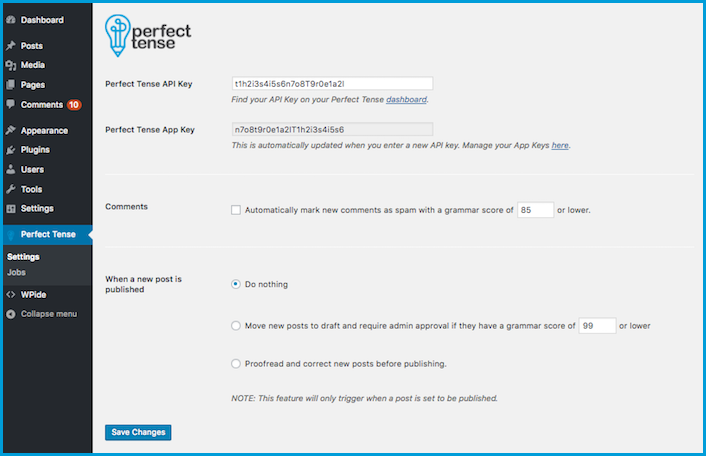 Download the official Perfect Tense plugin for WordPress!